One Eternal Day: Is Easter pagan? 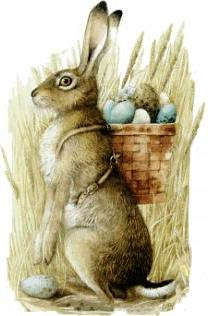 ...The Christian title "Easter" ... reflects its general date in the calendar, rather than the Paschal festival having been re-named in honor of a supposed pagan deity. Of course, the Christian commemoration of the Paschal festival rests not on the title of the celebration but on its content—namely, the remembrance of Christ's death and resurrection. It is Christ's conquest of sin, death, and Satan that gives us the right to wish everyone "Happy Easter!" Of course, even if Christians did engage in contextualization—expressing their message and worship in the language or forms of the local people—that in no way implies doctrinal compromise. Christians around the world have sought to redeem the local culture for Christ while purging it of practices antithetical to biblical norms. After all, Christians speak of "Good Friday," but they are in no way honoring the worship of the Norse/Germanic queen of the gods Freya by doing so. Good history and good sense. Even the bunny and the egg — like Santa Claus and the Christmas tree — are , at worst, relatively harmless distractions.